Your guests will be delighted to receive one of these delicate folding fans decorated with a silver scallop design. They will add a classy finish to your summer occasion when personalized with a name and date. Add a beautiful touch to your event tables with these pretty white fans decorated with a silver scallop design. The fans are fashioned from a light colored wood and feature a stunning intricately carved design. They have a collapsible ribbing structure with an outstretched silk fan attached. Folds into a compact shape and looks stunning when open! Add a unique touch to the fans by using personalized clear stickers, showcasing your name and the date of your special event, creating a high-class gift that will be treasured for years to come. I'm interested in the personalized silver scallop folding fan favors. The problem I have is that line 2 does not have enough character space; can more characters be added? I'm sorry, we cannot change the template maximum characters at all from what is provided on our site in the preview tool. The Text Line 1 can only fit a maximum of 20 characters and 10 characters for text line 2. I want to order a personalized sample. Once I enter my personalized info, how do I add it to shopping cart? For sample orders, you will not be able to specify personalization for this Personalized Wedding Silver Scallop Folding Fan Favor. Your item will consist of a random representative sample. What assembly is required for these folding fam favors? Assembly is required for you to put on the stickers to the fan. It's from an easy peel sheets so it would be easy for you to stick it on the Personalized Wedding Silver Scallop Folding Fan Favors. I am looking at Personalized Metallics Collection Silver scallop folding fan favor, are those stickers or is it hand printed? It's a sticker that comes on easy peel sheets sized at 8.5" x 11". 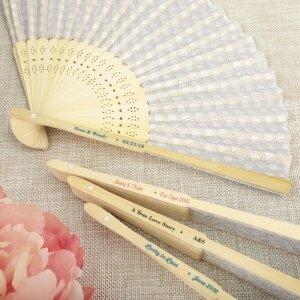 The size of the Personalized Wedding Silver Scallop Folding Fan Favor is 8" and it's made from light colored wood with an intricately carved design. Hi. For the "Personalized Wedding Silver Scallop Fan Favors" - is it possible to fit "Christopher & Cathinerine" on one line? You can only put maximum of 20 characters on text line 1 and 10 characters on line 2 so that won't fit when you purchase this Personalized Wedding Silver Scallop Folding Fan Favor. You need to rephrase the text and please note that it also counts the space. Looking at the personalized hand fans for a wedding. The description says silver scallop-- how silver is it? It looks white. The Personalized Wedding Silver Scallop Folding Fan Favors have a small hint on the silver. If you are concerned about the color, I would suggest ordering a sample first. I would like to know if the silver scallop folding fan favors can be personalized. Yes, the Personalized Wedding Silver Scallop Folding Fan Favors can be personalized. If you go to your cart there should be a button that says 'Complete Missing Info' under the Personalization section, and that's where you can personalize it.